Light and fluffy, this Choco-Spice Layer Cake with Mocha Buttercream Frosting has a mild taste of cinnamon and a slight hint of chocolate and coffee. 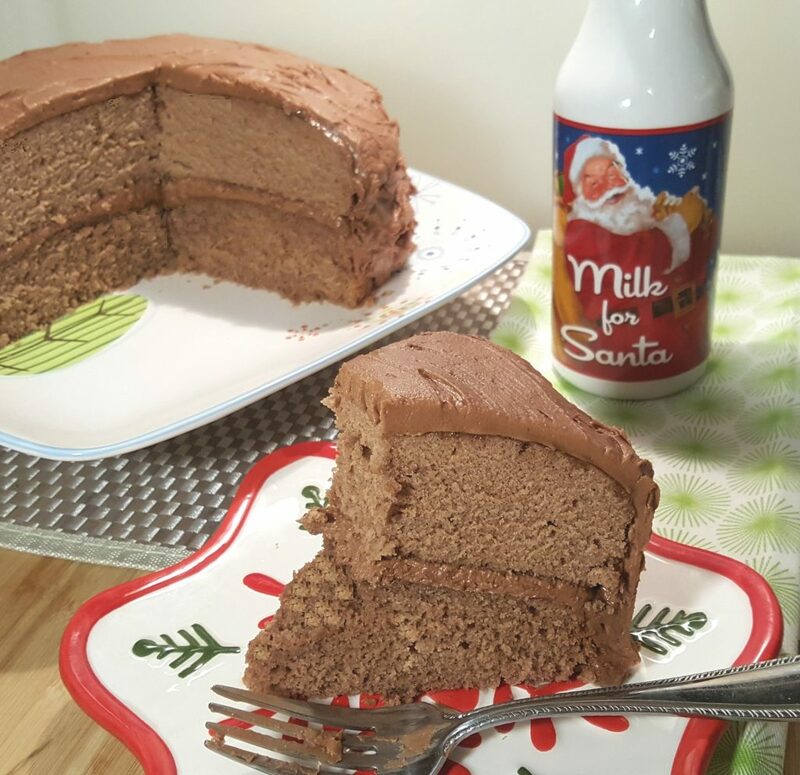 A little birdie once told me that while Santa loves Sugar Cookies and Milk, he would prefer to have a nice Layer Cake and Milk. That little birdie loves his cake. With that in mind, I thought I would do an experiment. Broaden my horizons. One of my favorite cakes is the Choco Spice Layer Cake which I saw in my Penzy’s Spice Catalogue several years ago. It is a moist and very flavorful cake and goes well with a nice hot cup of coffee. Years ago, I used to bake (steam) cakes in my Turbo Cooker. I loved that machine so much and ended up doing a infomercial for the creators. They had come up with a new product called Turbo Grill. They asked me to review and then filmed me for the infomercial. The Turbo Grill never caught on. I digress. When I was showing cats, I often times brought a cake for my group of exhibitors. The Turbo Cooker makes great cakes using steam. 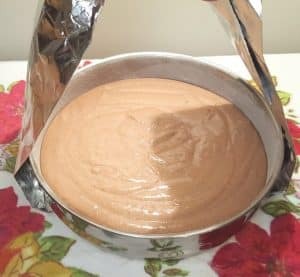 The Pressure Cooker also cooks, using steam, so I thought, why not, let’s do a side by side comparison of this Choco-Spice Layer Cake using the oven and the Pressure Cooker. In a Medium Mixing Bowl, combine the very soft room temperature butter with the sugar. 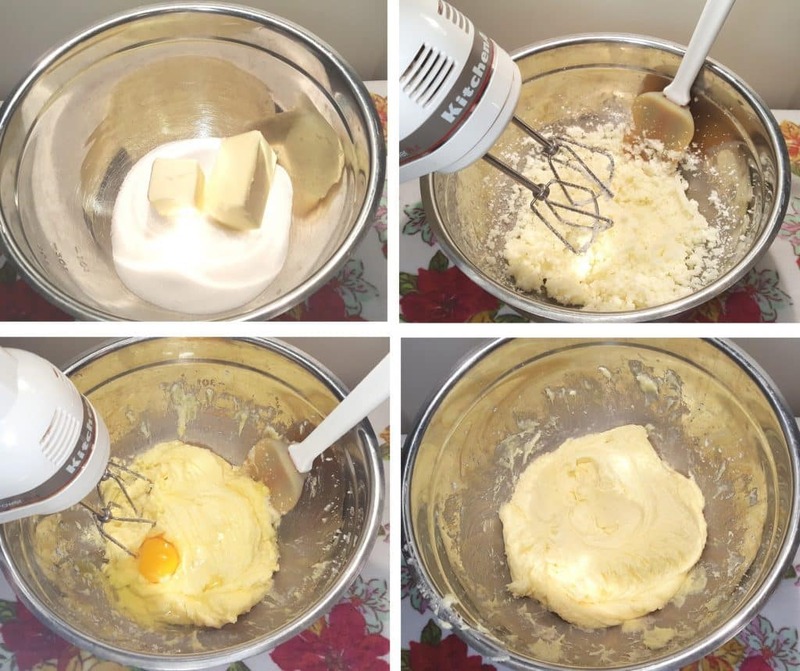 Using an Electric Hand Mixer, beat at high speed, until well combined. Add in the eggs, one at a time and mix. Make sure to scrape down the sides. In a Small Saucepan, on a very low heat, add milk. 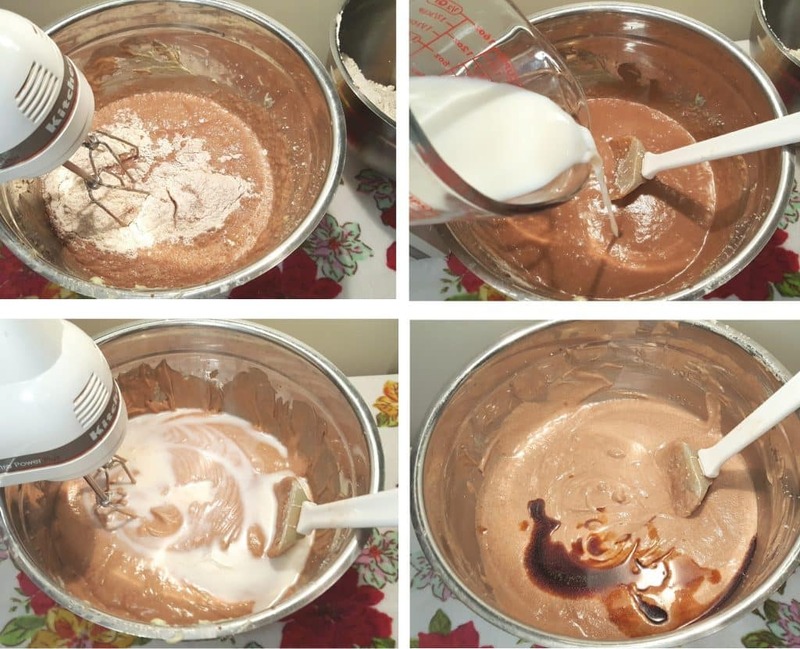 Sprinkle in Cocoa Powder and Whisk until completely dissolved and combined. The milk should be warm and not hot. 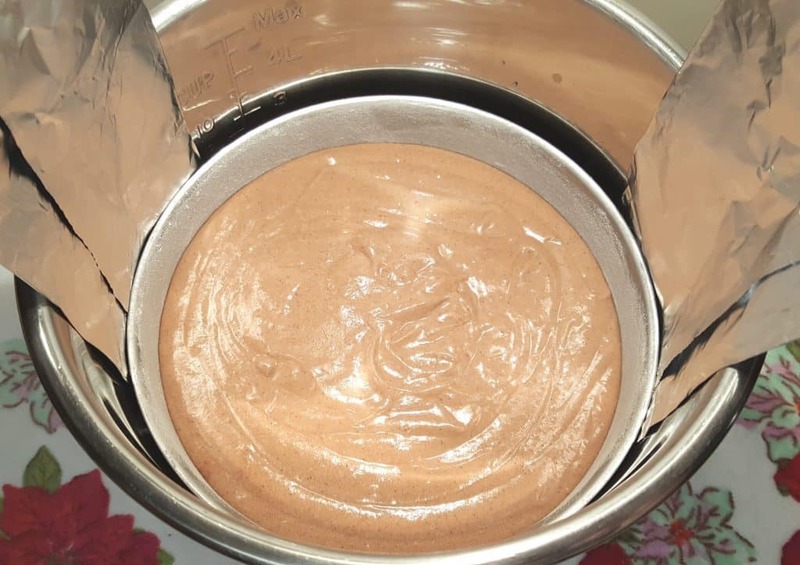 With the Electric Hand Mixer running, gradually add the Cocoa Milk to the Sugar/Butter mixture and beat well, making sure to scrape down the sides. 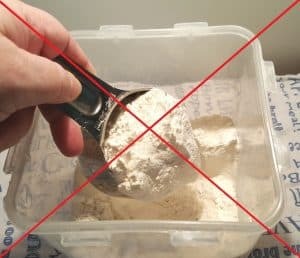 If you don’t read anything else of this story, please at least read my article on How to Properly Measure Flour. I don’t want you to end up with a rubbery or a brick Choco-Spice Layer Cake and then blame the recipe. The original recipe calls for Cake Flour, which is a softer flour. I was out. I was craving this cake and was determined to bake it anyway. I make the best homemade New York Style Pizza Dough, so I always have Antimo Caputo 00 Pizzeria Flour (Blue Bag) on hand. The problem was that I only had about two cups left. I wanted the cake and decided to experiment. I combined what I had left of the Antimo Caputo 00 Pizzeria Flour (Blue Bag) with the balance needed of All Purpose Flour. Oh my gosh, am I ever glad that I was out of Cake Flour! This Choco-Spice Layer Cake was considerably better than when using Cake Flour! The consistency was moister and more tender. My Choco-Spice Layer Cake recipe, has been permanently changed! So, in another Mixing Bowl, use your Baker’s Scale to weigh your flour. If you do not have a Baker’s Scale, make sure to properly measure your flour and the spices. Use a Microplane Stainless Steel Zester to grate the Whole Nutmeg. Alternate adding the Flour Mixture and the rest of the milk into your mixing bowl and beat after each addition. When well mixed, add the vanilla and beat again. Make sure to scrape down your sides. This is the Stainless Steel Pan I use for my Pressure Cooker Perfectly Cooked Pot in Pot Rice recipe. I love this pan because it does double and triple duty. It is the perfect size for this cake at almost 8 inches. The mini pans it comes with can be used for my Quick Egg Custard recipe. For baking in the oven, place two cake pans in the oven and bake, until toothpick test comes out clean. Some people like to use Grafiti Bands Cross Style as they make it so easy to get pans and bowls in and out of the Pressure Cooker . Add some water into your Pressure Cooker cooking pot and place a Trivet. Using your Sling, lower the Cake Pan into the Pressure Cooker cooking pot. You are all ready to bake! After the Pressure has been released, remove your cake and place it on a wire rack. Use a toothpick, knife or cake tester and insert into the cake, about 1/2 down. The knife/toothpick should come out clean. If it is not clean, but the cake back into the Oven or Pressure Cooker for another five minutes, or until done. After 10 minutes, invert cake and allow it to rest on the wire baking rack. Allow the cake to cool all the way before frosting with my Sinfully Delicious Mocha Frosting Recipe. I am horrible at frosting, but here is how you do it. I hope your execution is better than mine! I think my cat’s execution would be better than mine. This is the ugliest Choco-Spice Layer Cake I have ever seen! Hehehe. Show me some photos of yours! In order to layer the cakes, take a very sharp knife and cut the tops off, so that the tops are nice and flat. Place one cake on a tray and evenly spread the frosting. Take the second layer and place that on top of the cake and spread the frosting. After cutting the roundness off of the top of the cake, it is easier to flip over the cake and place it on top of the frosted layer. That will give you a very flat cake. I did not do that here, because I wanted a rounder cake. 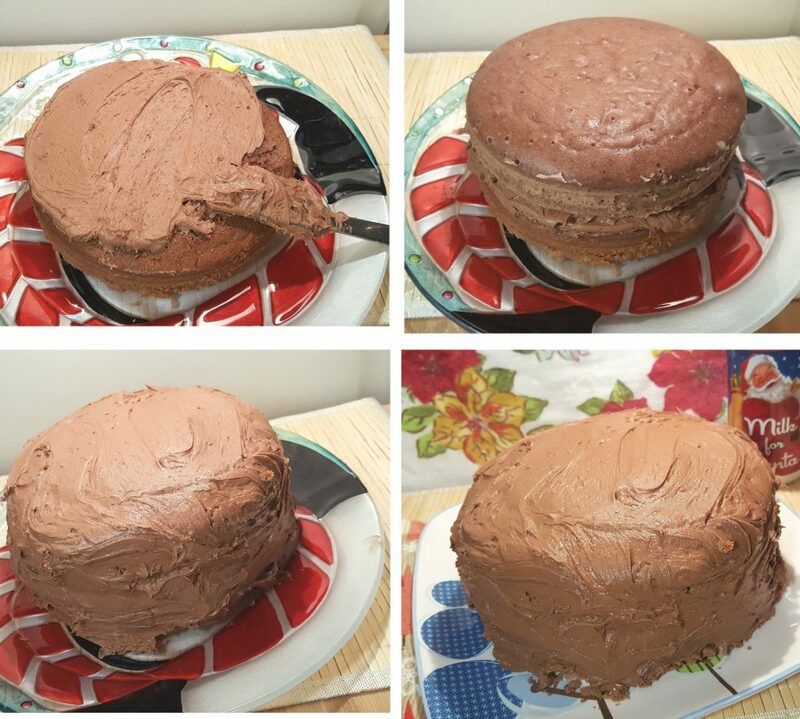 One layer of this cake was baked in the Pressure Cooker and the other layer was baked in the Oven. There is literally zero difference in taste. Can you tell the difference? This Choco Spice Layer Cake with Mocha Buttercream Frosting recipe is great to use to make Cup Cakes! It is also a good recipe to use, to make cake in a jar. This cake freezes well. I like to slice it first and place waxed paper between each slice, so that I can grab a slice from the freezer, whenever I like. Enjoy! 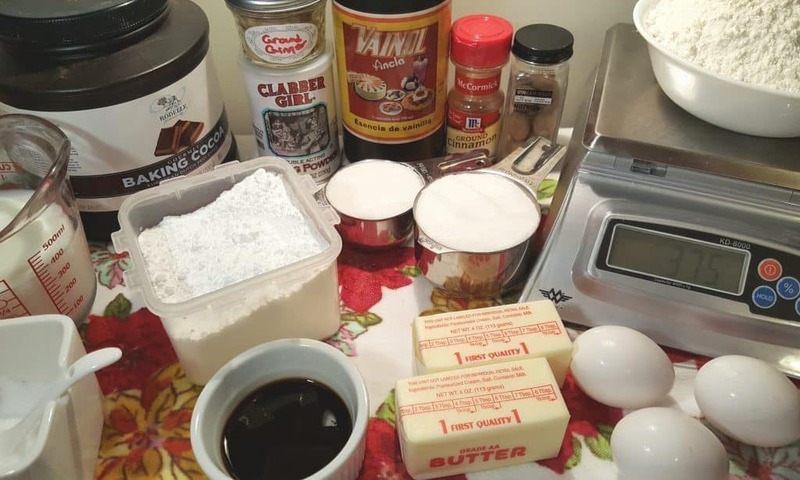 In a large mixing bowl cream together butter and sugar until light and fluffy. In a small pan heat ¾ cup milk and sprinkle in cocoa powder. 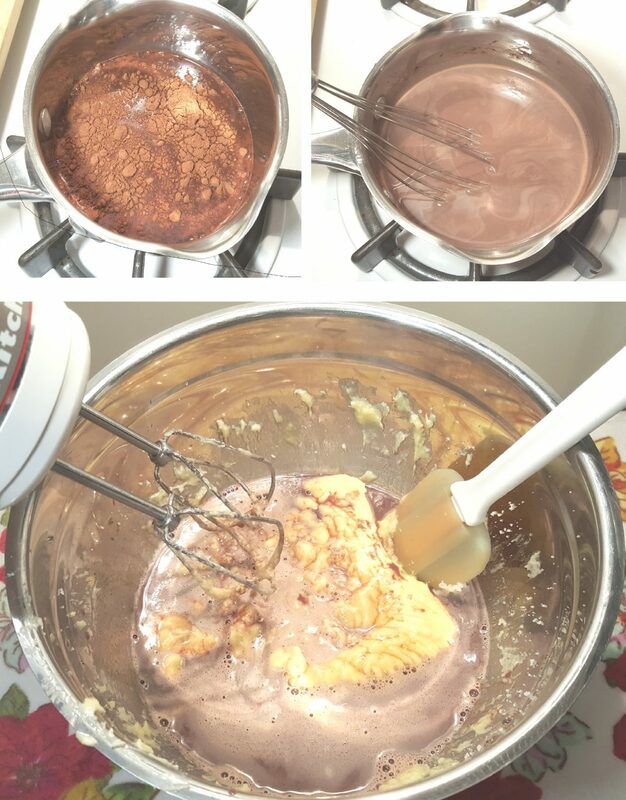 Stir until the the cocoa powder is dissolved and milk is warm, NOT hot. Pour into butter mixture and beat well. In a separate bowl sift together flour, salt, baking powder, cinnamon, nutmeg and ginger. Slowly add the flour mixture with the remaining milk to the Butter mixture and beat well after each addition. Add vanilla to batter and beat to combine. Pour half (700 grams) into greased and floured 7.5 inch cake pan. Add 1.5 cups of water to Pressure Cooker cooking pot and place a Trivet. Using a Sling, lower pan into Pressure Cooker. Cook at High Pressure for 30 minutes. When Beep sounds, allow a 15 minute Natural Pressure Release. Insert cake tester into middle of cake to test for doneness. Cake tester should come out clean. Cool in pan for 10 minutes and then turn out onto wire racks to cool. 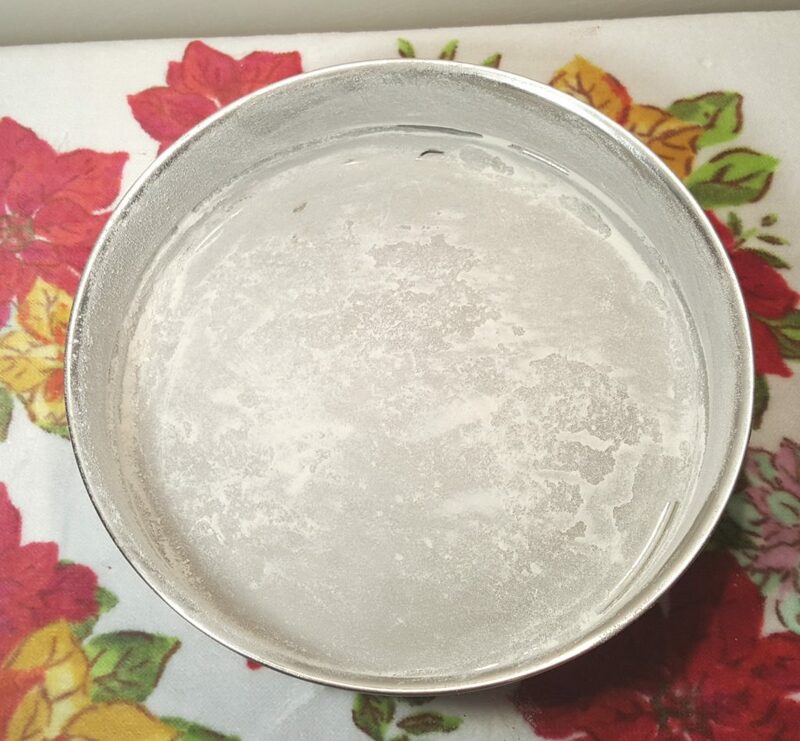 Dump water from Pressure Cooker cooking pot. 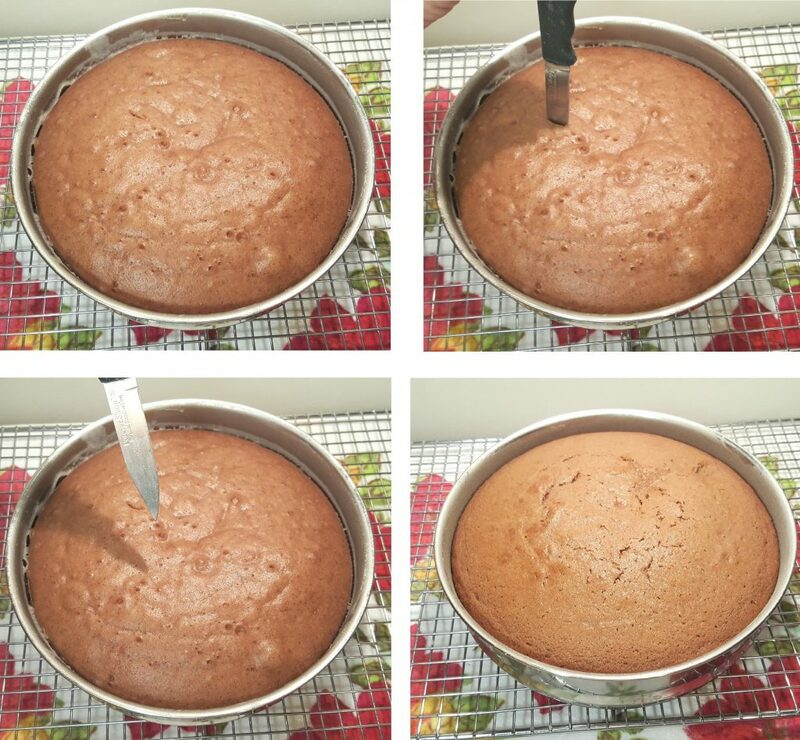 Repeat process for second cake, using cool water in the Pressure Cooker cooking pot. Pour into two greased and floured 8 inch cake pans, approximately 700 grams each. Bake for 35-40 minutes until brown and springy. Insert cake tester into middle of cake to test for doneness. Cake tester should come out clean. Cool in pan for 10 minutes and then turn out onto wire racks to thoroughly cool. 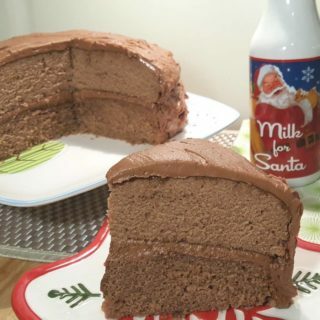 Use my Sinfully Delicious Mocha Frosting Recipe and frost cooled cake. 6 Tablespoons Potato Starch + enough All Purpose Flour to equal three cups can be substituted for the 3 cups of Flour. PIN this Choco-Spice Layer Cake! So which layer was cooked in the pressure cooker? The top layer was cooked in the pressure cooker. Is it possible to stack and cook both layers at once? Possibly, with the right pans and trivets. You don’t want to seal off one pan with another. Would this recipe convert well using gluten-free flours? ❤️ Spice cake!